The chrono-functional (CF) format is a resume of ability-focused topics — portable skills or functional areas that position you best for your new job target (or to overcome some challenge in your timeline). It ignores chronological order or even whether a particular skill came from employment. However, the chrono-functional format backs up all listed skills with a chronology that might come from employment, courses or education, volunteer work, and paid or unpaid internships. A chrono-functional resume format, which is used to overcome timeline challenges in your work history. 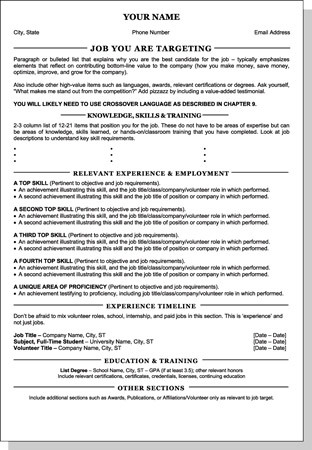 A CF resume directs a reader’s eyes to what you want him or her to notice. It helps a reader visualize what you can do instead of locking you into when and where you learned to do it. CF resumes salute the future rather than embalm the past. The CF format — written after researching the target company — serves up the precise functions or skills that the employer wants. It’s like saying, “You want budget control and turnaround skills —– here’s where I offer budget control and turnaround skills.” The skills sell is a magnet to reader eyes! It uses unpaid and nonwork experience to your best advantage. The CF format allows you to eliminate or subordinate work history that doesn’t support your current objective. Recruiters and employers are more accustomed to reverse chronological formats than other types. Departing from the norm may raise suspicion that you’re not the cream of the crop of applicants. Readers may assume that you’re trying to hide inadequate experience, educational deficits, or who knows what. Functional styles may leave unclear which skills grew from which jobs or experiences. This format doesn’t clearly describe your career progression. The chrono-functional resume is heaven-sent for career changers, contract workers, new graduates, ex-military personnel, seasoned aces, and individuals with multitrack job histories, work history gaps, or special issues. Job seekers with perfect backgrounds (no gaps, career changes, or the like) and managers and professionals who are often tapped by executive recruiters should avoid this format. Choose areas of expertise acquired during the course of your career, including education and unpaid activities. These areas become skill, competency, and functional headings, which vary by the target position or career field. Note accomplishments below each heading. A few examples of headings are: Operations Management, Sales, Budget Control, Cost Cutting, Project Implementation, Growth, and Turnaround Successes. List the headings in the order of importance and follow each heading with a series of short statements of your skills. Turn your statements into power hitters with measurable achievements. The easiest way to do this is to always write CAR statements — the challenge you faced, actions you took, and results you obtained. Your resume has a work history listed either above or below the experience and accomplishments section. Each top skill lists the role in which it was attained. If you do not make these key connections in your resume, prospective employers will question the validity of your skills and become confused about where or when they were used. By providing this small bit of connective data, you make a chrono-functional a safe choice when navigating career challenges on your resume.